On some mornings, the ability to mix together just a few basic ingredients to make a hot breakfast is invaluable. That's when products like Aunt Jemima Pancake and Waffle Mix are a welcome sight in the cupboard. Follow simple directions to turn the dry mix into fluffy, golden pancakes. Coat your skillet or griddle with shortening, butter or oil. Aim for a lightly greased surface. Preheat your skillet on a medium-low burner for 10 minutes, or set your griddle to 375 degrees Fahrenheit. Measure out 4 parts Aunt Jemima mix and 3 parts milk. Combine them in a mixing bowl. Whisk together an egg and a spoonful of vegetable oil for every 1 cup of pancake mix. Add them to the ingredients in the mixing bowl. Stir until all of the ingredients are well-combined and the larger lumps have dissipated. 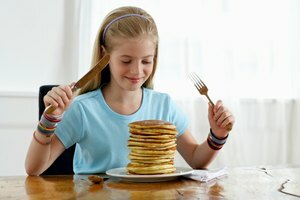 Don't worry about beating out all of the lumps; overbeating leads to tough pancakes. Leave the pancake mix to settle for about two minutes. Fill a 1/4-cup dry measuring cup not quite to the top with pancake batter, or use a ladle as your batter scoop. Pour the batter into the center of your skillet. If you have a large griddle or oversized skillet, repeat with other dollops of batter to cook more than one pancake at a time. Leave plenty of room between the pancakes so that they don't run together. Look for bubbles on the surface of a pancake, then lift up the edge with your spatula to confirm that the bottom is turning light brown. Flip the pancake and continue cooking it on the other side. Remove the pancake when the other side is also golden brown. Continue cooking pancakes until you've used up the batter. Most Aunt Jemima pancake mixes are also suitable for making waffles. Use the same proportion of ingredients, but use an extra spoonful or so of oil in the batter. 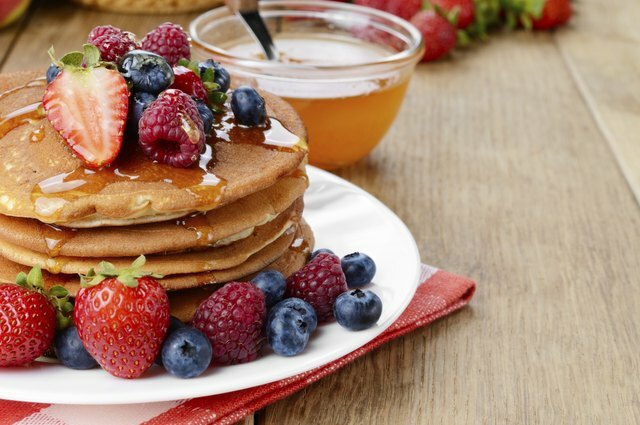 For variety, add nuts, chopped fresh fruit, fresh berries or applesauce to your pancake batter. For every 4 parts of pancake mix, gently fold in 1 part of any of these extra ingredients. Or sprinkle in cinnamon or brown sugar to taste. 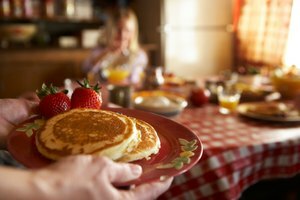 When you're making pancakes for a crowd, preheat your oven to 250 degrees Fahrenheit at the same time you're warming up your skillet or griddle. Transfer batches of just-cooked pancakes to a cookie sheet in the oven, and keep them covered with foil. Heat them in single layers on the cookie sheets. Along with maple syrup, other toppings for pancakes include berry syrup, fruit jam, honey, butter and powdered sugar, and fresh fruit.